Many college presidents in the United States are urging lawmakers to lower the minimum legal drinking age from 21 years. While this may obviate some of the problems college administrators encounter because of their students' underage drinking, the adverse consequences to youth would likely be substantial, as outlined by Hingson. The lower minimum legal drinking age is likely to increase the number of alcohol-related fatalities, especially traffic crashes, and increase other consequences of binge drinking, such as unsafe sexual activity, dating violence, poorer school performance, potential impact on brain development, and greater chance of later alcohol dependence. While “advergames” have been used by marketers to combine computer games with advertisements for their product, they also have the potential to promote healthier food choices. In this study of9- to 10-year-old children, those who played a game featuring a healthy snack, such as orange juice or a banana, were significantly more likely to eat a healthy snack after the game than were children who played a game that featured junk food, such as soda or potato chips. Nearly all children this age were online at least weekly, and 36% of girls visited food Web sites. These findings suggest that public concerns about online advergames that market less healthy food and beverages to children are justified. Tooth decay is the most prevalent childhood chronic disease, 5 times more common than asthma, and the prevalence of early childhood caries is rising. Xylitol is an effective agent for preventing tooth decay, through its selective antibacterial actions against mutans streptococci, an important cause of tooth decay. 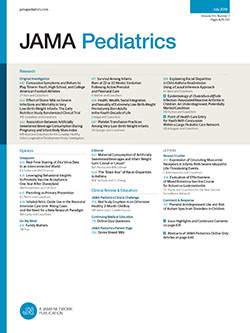 In this randomized trial, 9- to 15-month-old children were randomized to receive 8 g of xylitol in a syrup or 2.67 g daily for 1 year. At 24 months of age, children receiving the higher dosage of xylitol in 2 to 3 daily doses had an up to 70% reduction in the rate of tooth decay. This is likely to be a very cost-effective intervention in populations at high risk of early childhood caries. This study examined the potential counterbalancing effects of movie smoking exposure and participation in team sports on the risk of established smoking among 2048 youths at ages 16 to 21 years. Those who were exposed to the most movie smoking were 63% more likely to be established smokers at follow-up than were those in the lowest quartile of exposure. Those not participating in team sports were twice as likely to be smokers than were participants. At each level of exposure to movie smoking, those not participating in team sports had a greater risk of being established smokers at age 16 to 21 years. Prevalence of established smokers across quartiles of movie smoking exposure stratified by team sports participation.